Centsible Savings: Christmas tree decorating – upside down or right side up? Christmas tree decorating – upside down or right side up? I can’t wait to decorate for Christmas this weekend! Good thing I haven’t had time to decorate yet, because this year has been the hardest year to wait to do it! Ok, so maybe I am a traditionalist, but my idea of a Christmas tree is something like this… beautiful white lights, decorated with ornaments, and maybe a bow or angel on top. 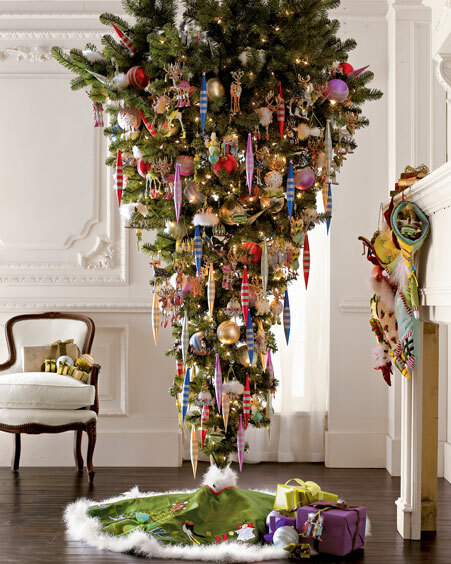 But apparently some people like to have their Christmas tree – UPSIDE DOWN! Check out this tree I found at Home Depot! 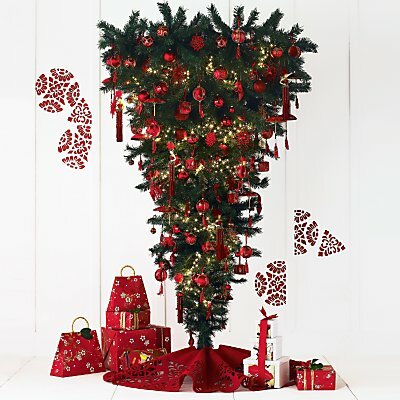 And here are some decorated upside down Christmas trees! Yeah, that's a little too different for me too! Never heard of such a thing before! About 15 years ago, I bought a white tree, decorated it with crystal ornaments and purple lights - was beautiful! It lasted about 2 hours. My cats attacked it and broke almost everything. Sincce then, my tree is always hung up-side down, mounted from the ceiling. I can have a beautiful tree and they can't get to it. mmmm. I don't get it...sorry. Not my cup a tea.